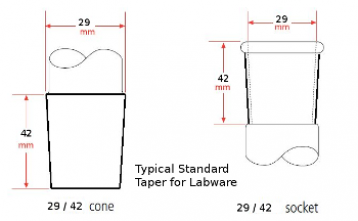 Round Bottom Flasks have a smooth internal finish, are inert and usable to 280°C. Tapers match standard ground glass joints. Without sealing rings. Other sizes on request. PTFE used in the manufacture of COWIE® PTFE Laboratory Products is pure virgin material which conforms to FDA and USP Class VI requirements. 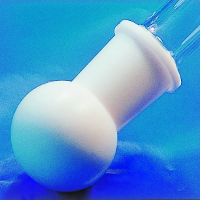 In everyday use and transport, PTFE Round Bottom Flasks are unbreakable. The first number represents the outer diameter (OD) in millimeters (mm) at the base (widest part) of the inner joint. The second number represents the length of the joint in millimeters.